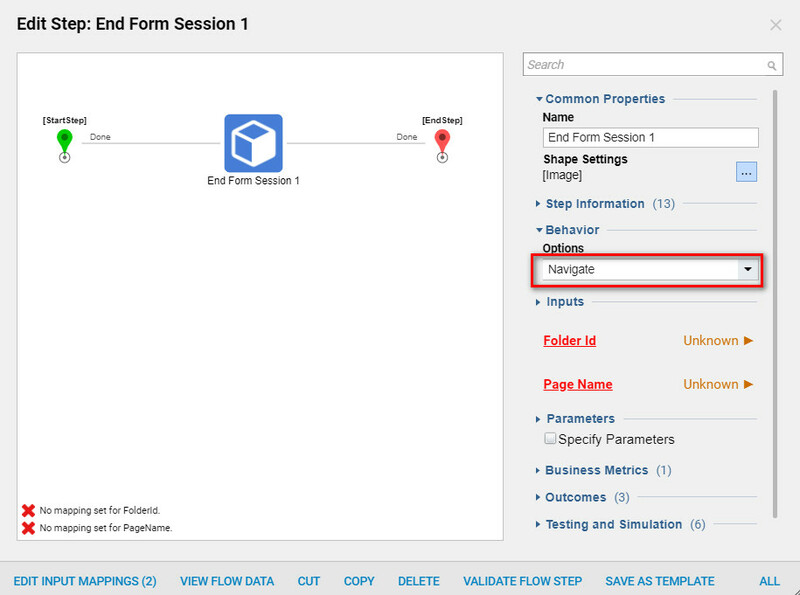 Set up an Entity Action Flow	with an End Form Session Step	. This example shows how the End Form Session Step	will navigate to a dashboard that displays information gathered from related information on a report. First, create an Entity Data Type	, create a User Action	from the configuration folder	, and two separate flows. This example assumes that the report or dashboard that the End Form Session Step	navigates to has already been created. 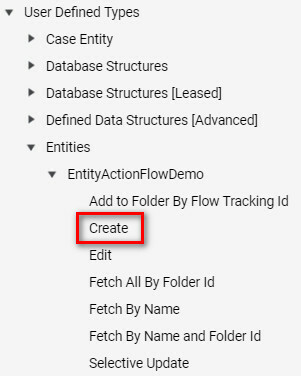 to set up an entity action flow go to your designer folder, begin by selectingDatatypes/Database > User Defined Types > Entity	on the Actions Panel across the bottom of the designer studio. Name your Entity structure and create your data names. On the right side of the display box under Actions	check, show Add With Data, Show Description on Add, Show Delete Action, Show Edit Action	and select Save	. After saving theEntity Data Type	navigate to the Designer Folder**. **	After saving your Entity Data Type	theEntity	and theEntity Configuration Folder	can be seen in the Designer Folder. 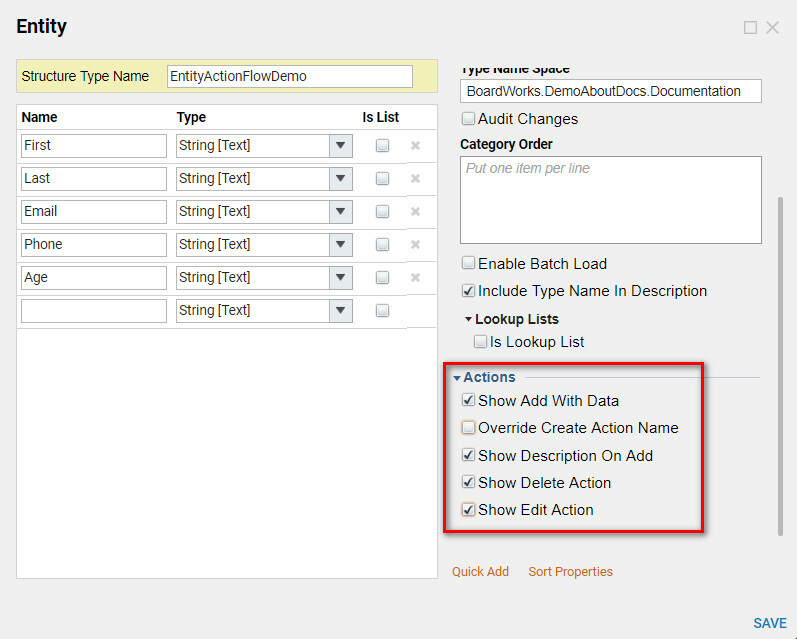 After selecting theEntity Configuration Folder , you can Create User Actions	for your flow. Select User Actions	in theAction Panel across the bottom of the Designer Studio. 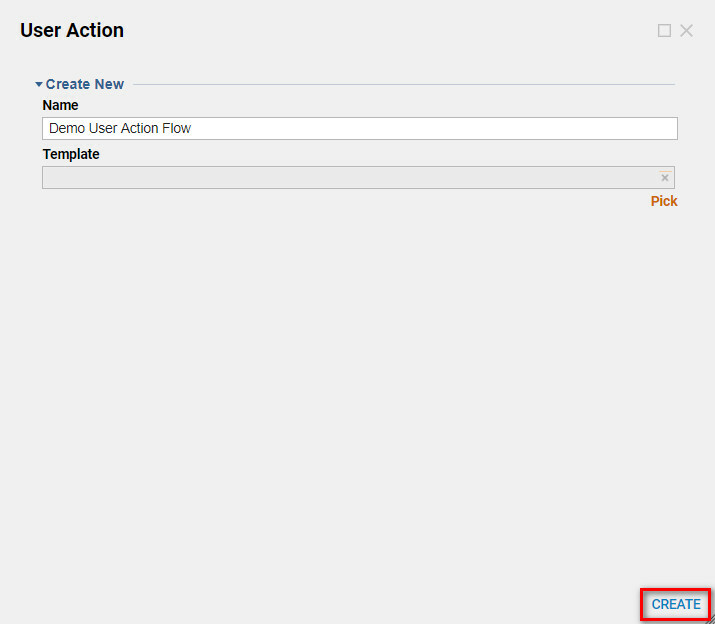 Name the User Action	and select Create,	this opens up a new flow where theEnd Form Session Step	can be configured. Now create a new flow in theDesigner Studio. L ocate the Step Tab on the right panel, under Forms	select End Form Session Step	, drag and drop step into the Designer Studio . SelectEnd Form Session 1	to Edit the step. In the Properties Panel on the right under Options	, select the drop down menu and choose Navigate. Connect the pathways and exit flow designer. 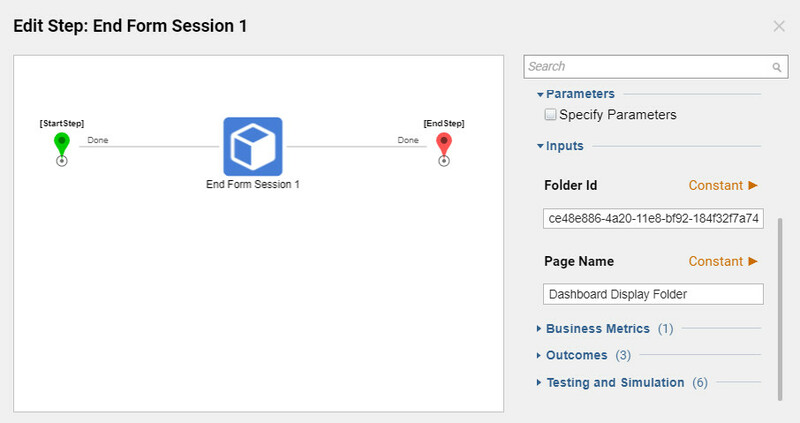 Navigate to the desired Folder, URL, Page or Dashboard that the End Session Form Step	will direct the User to. Right click and select Folder>Manage>Folder ID>(Copy ID). Navigate back to yourEnd Form Session Step	. 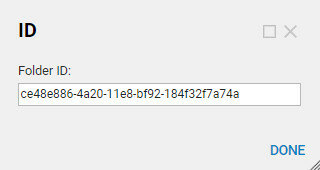 UnderInputs set the Folder ID	to Constant and paste the Folder Id	that you copied. Now set Page Name	to constant and name the Folder. Select Folder ID	and highlight and copyID	number. 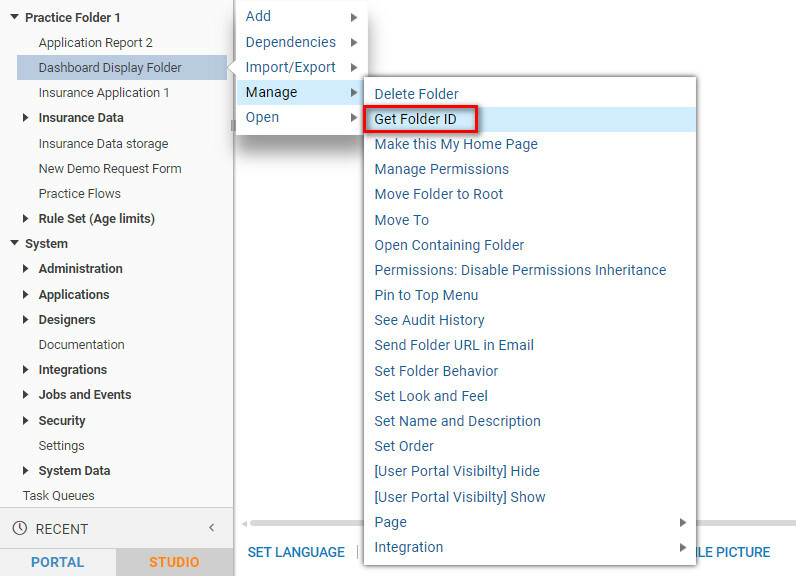 Navigate back into theUser Action Flow	with End Session Step	and setFolder Id	and Page Name	toConstant and input your data. Now set up the User Action Flow	, navigate to the Designer Studio and Create a new Flow. 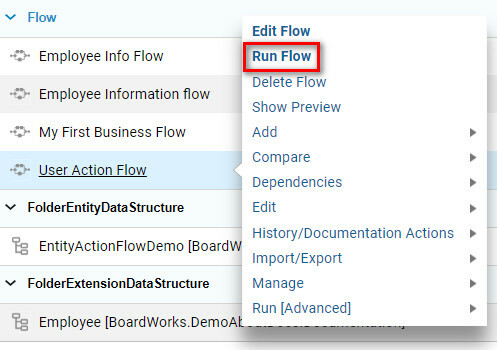 Inside the Flow Designer in the Steps Tab of theProperties Panel select User Defined Types>Entities>(Select Entity Flow)>Create. Drag and drop the Create Step	in theDesigner Studio work space and connect the pathways. Select the Create Step	and configure the settings in the Properties Panel on the right. UnderInputs	and Next to Folder Id	change value to Constant	. Select Pick	to locate the desired Folder. 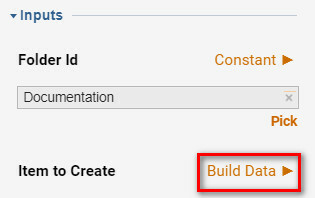 Next to Item to Create	choose Build Data. Set Name to Constant,	name your Action	. After you runAction Flow	, the User Action Entity	will appear in your Designer Folder.